ISPRIME Review 2019: Is ISPRIME a Good Hosting? ISPRIME is a fast-growing IT company that was founded in 1998 by three budding entrepreneurs. With redundant networks and secure data centers, ISPRIME is a fantastic choice for customers who are looking for an all-in-one hosting platform. ISPRIMEis a premier web hosting company that provides managed dedicated servers, VPS, and bare metal servers in addition to premium backups, security, and CDN to customers in the US and the EU. The company boasts of state-of-the-art facilities with powerful Dell hardware that delivers 100% network uptime. With their fully managed hosting packages, you get powerful and secure hardware with a number of features designed for high-performance and business continuity. Their selection of DELL PowerEdge Servers run on 1 GBit networks and RAID storage means downtime isn’t a factor. They also have a dedicated support team that can take of architecture, capacity planning, and server optimization so you can focus on growing your business. 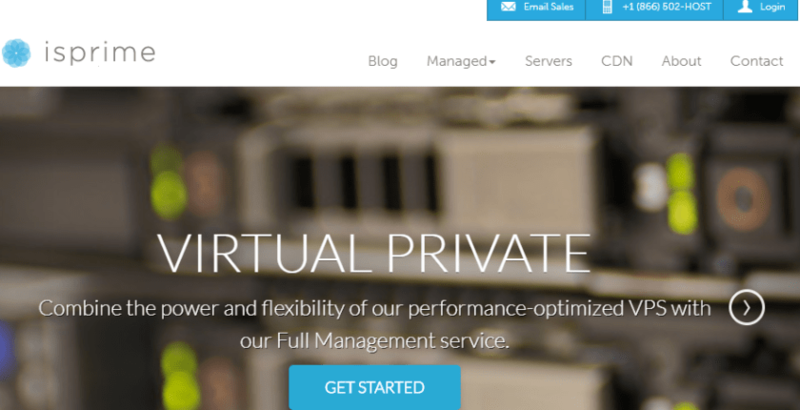 If you operate a small business or a start-up, you should consider their managed Virtual private servers. They’re suitable for customers who want flexible VPS solutions that grow with their businesses. With their starter package, you get 1 vCPU, 1GB RAM, 25GB disk space, and 1TB monthly bandwidth. You can scale up to 10 vCPUs with 300 GB Storage and 10 TBTraffic. With every configuration, you get full root access via SSH and uptime guarantee. Bare metal dedicated servers are the other option for customers who want high-performance servers with no downtime. Running on Dell PowerEdge hardware, they’re suitable for tech-savvy developers or anyone who is brave. Set up is fast. You also get to choose your preferred OS. PowerEdge Standard is their introductory plan. It comes with four cores, 2.50 GHz CPUS, 4GB RAM, two x 146 GB SAS storage, and 2TB bandwidth. Other plans are PowerEdge Enhanced, PowerEdge Enhanced+, PowerEdge Performance, and PowerEdge Performance+ with incremental features. At the high end of the spectrum is PowerEdge Custom with 24 cores, 2.93 GHz CPUs, 192 GB AM, 24 x 240 GB SSD storage, and 500TB. Managed servers are also available to customers who prefer a less hands-on approach. They’re suitable for e-commerce resellers, medium-sized enterprises, and agencies who want to focus more on business-side and not on the technical aspects of hosting. With their 6-Core Intel Xeon server, you get 12 GB RAM DDR3, 2 X 250GB SSD, and 5TB monthly bandwidth. You can also order a custom managed server with more RAM and storage for demanding applications. With any package, you are assured of fast issue response and monitoring, fast hardware replacements, and no downtime. You will be assigned a dedicated support team that will optimize servers, patch software, and carry out system updates. ISPRIME has a simple and mobile-friendly website with an intuitive control panel. I like the fact that they let customers choose their preferred OS and server configurations. Setup is fast. With no upsells or and clear benefits on every service page, you shouldn’t have a problem comparing plans and ordering a hosting package. Managed storage – they build and customize business storage solutions such as direct attached storage or network attached storage that grows with your company’s need. Managed databases – their database administrators will do real-time monitoring, clustering, and load balancing to ensure optimal performance of your MySQL. PostgreSQL, and Mongodb databases. Managed backups – their offsite server backups cushion you against data loss resulting from accidental deletion, hard drive failure, or disasters. Managed security – they provide a range of security-specific tools to combat DDoS attacks and other online threats. With a friendly sales, billing, and support team, ISPRIME is able to provide answers and the support you need promptly. Just call their phone, open a ticket, or start a live chat whenever you need assistance. Their sales and billing team is available Mon-Friday from 9 am to 5 pm (EST) while their technical support is available 24/7. Fast and responsive, their on-site technicians can resolve server issues within minutes and replace damaged hardware within one hour. On top of that, ISPRIME has a wonderful knowledgeable base that covers various aspects of web hosting. You can learn how to manage your web space, configure your DNS, set up a database, and transfer files using FTP among other things. So be sure to check out that section for answers too. ISPRIME provides good hosting packages including dedicated servers with flexible support levels and a money back guarantee across all levels. Wondering how ISPRIME stacks up against other Web Hosting companies? Enter any other Web Hosting company and we will give you a side-by-side comparison.